It is also, therefore, the time of the year to start decorating your home for the holidays and we are sure you have already started to think about it! In fact, Christmas is that time of year when even those who are resistant to change, start changing the décor to suit the season. The tree is a must, but you can't stop there… candles, garlands, wreaths, the nativity scene, stars! A whole world of preparation which you won't want to leave till the last minute. You definitely would not want to place an article in your living room that should have rather remained in the mall. You can create a Christmas that you want, when you plan and design it calmly according to your tastes, until it is perfect for you. There is no need for you to buy expensive accessories to decorate your home. Of course, if it is your taste and if you're into trends, there is a multitude of expensive accessories—classics—at your disposal. If you have simpler tastes, though, love nature, and are adept to DIY, this is the article for you. Take a tour of the outdoors to collect leaves, trunks, branches, pine cones and berries. After this, you can get to work to create simple decorations, to which you can add more elaborate touches, if you should wish. Using natural materials and a rustic style, you can fill your home with light and colour today with our eight ideas to decorate your home for Christmas! Pictured here are very traditional Christmas decorations in white in silver, but the Christmas stars in the back will ensure a spectacular effect in any home. These stars are made of vine branches tied to each other with tendrils and wires, finally wrapped in garlands of LED lights. Start out by making isosceles triangle, tying three branches together, and then use the wider angle to build the rest of the star. Now you can use the tendrils to build a network around this structure. If you don't have enough tendril at your disposal, you can rather use the same thread you used to bind the branches. That's it, and they're ready! Now, just decorate the stars to your liking and wind the LED garlands around it. Ancient civilisations considered the tree a divine symbol—they cultivated trees and performed festivals in their honour, since they considered a tree's vertical position a symbolic alliances between heaven and earth. At the winter solstice trees were adorned with ribbons, flowers and fruits of the season. With the onset of Christianity, these customs were absorbed and incorporated into Christmas celebrations in honour of the birth of the saviour. Well, the concept remains to this day! In the case of decoration in the above picture, the concept of the tree was reduced to its minimal expression, maintaining the vertical idea and making reference to the form of conical firs found in the Nordic countries. Recalling the primitive Christmas trees, all of these decorative elements are natural and even edible. For the making of this tree, use wooden hoops with progressively smaller diameters, and suspend them atop one another. Ensure that the weight conferred on each hoop allows for the necessary rigidity in the thread to add more elements. You can spruce up the design using red, wax apples, nuts, pine cones, candles, and various other natural elements, all easy to find. Another tree concept, made of wood, is very environmentally friendly! We must not forget the planet. Every Christmas, tons of waste are deposited in landfills, and we must reduce the damage to the environment that this may cause. With this idea the tree was minimised to the concept of its structure. It consists of juxtaposed wooden slat stars which are fixed upon an axis, which is also made of wood. On the ends of these slats, circular depressions are created where candles can be placed. The decorative elements, such as bells and balls, are all in shades of red. 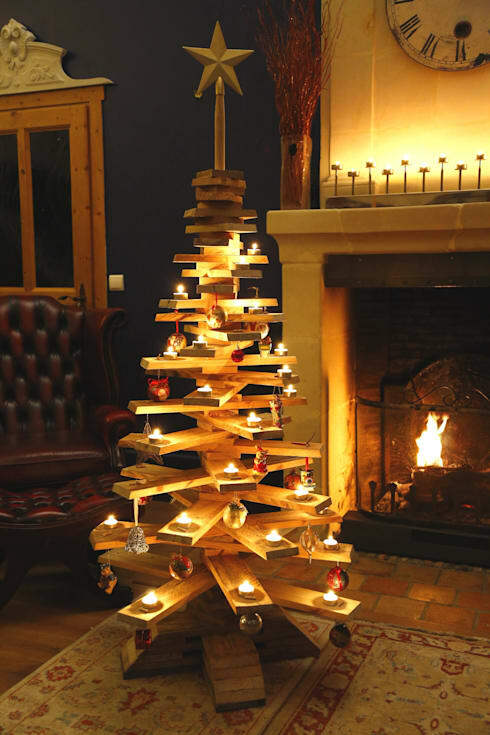 Relatively simple to construct, this tree is very decorative and bright with all the lit candles, suited perfectly to the rustic environment and countryside. What's more, if you don't feel like using it next year again, you can simply use it as fuel for the fire! This is a tree that's easy to make, and a great project to involve children. 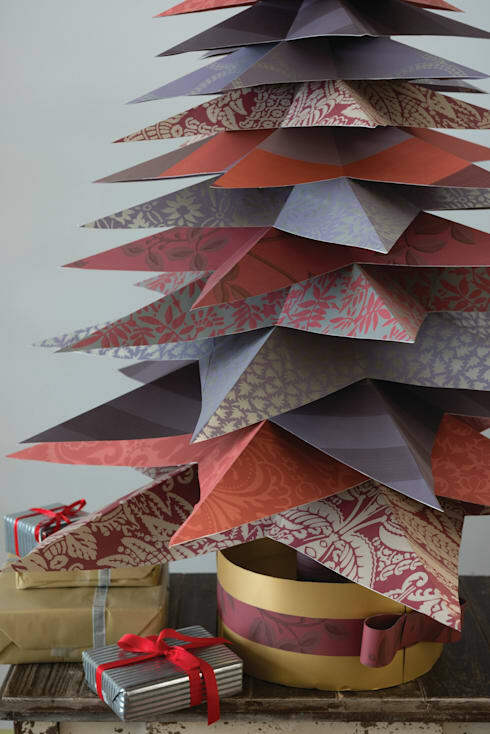 Use wrapping paper with different patterns, pasted on cardboard and cut into diamond shapes, leaving two tabs on one of the angles. Fold the diamonds in the middle and paste them four at a time using the tabs in order to build stars. The stars should gradually decrease in diameter. Stack them on an axis, which may be, for example, a stick and skewered piece of soap, to form a base. Top it off with a small star. Glue a strip of cardboard around the soap to refine the article, and you already have an unique decoration to adorn your home. Try it, the kids will love it! This decorating idea can be placed in the nursery, or in the kitchen where you need it. It serves to start the countdown to Christmas and is called an Advent Calendar. 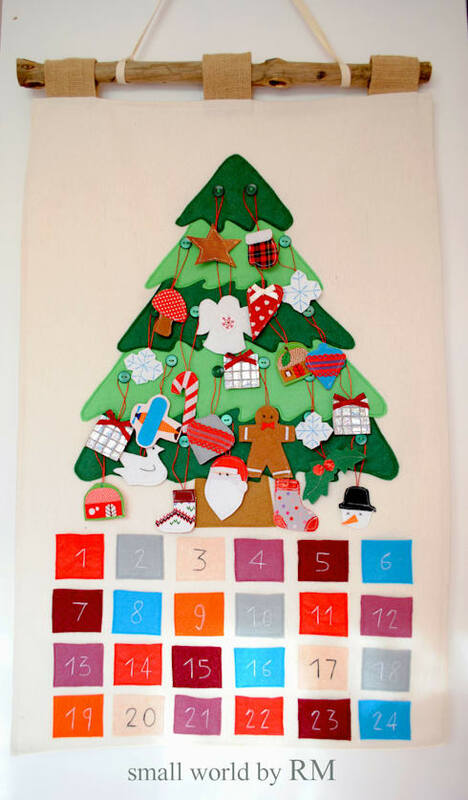 It is made from coloured felt cut and pasted into the form of a tree. The hanging decorations are also cut from felt. Felt is a fabric made from wool and other animal hairs, united by a chemical process, and then dyed. Simply make the moulds for your decorative items and cut and paste. Call the kids to help, and spend a fun, family afternoon. It is especially a great idea for a rainy afternoon. Santa Claus arrived and claimed a mountain of firewood! This holiday decoration is so cute and designed by the decorations shop, Wonders Of The Cradle, in Guimarães. 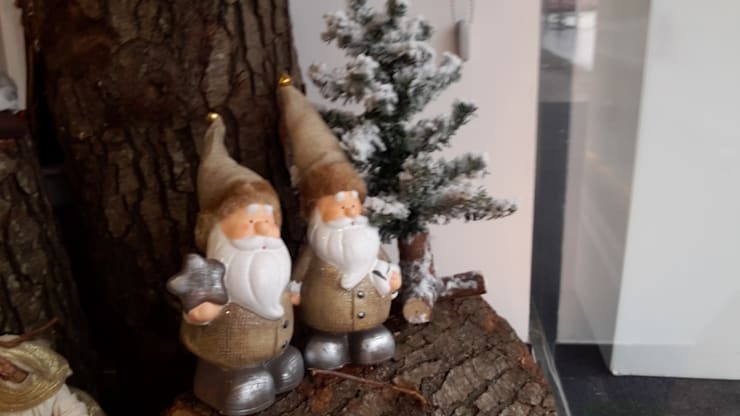 Using sawn wooden logs, simply stack two ceramic Santas with fabric caps and a small tree with artificial snow on top. This can be a rustic decoration which is very fun, simple and cheap. Fantastic for a home with children! 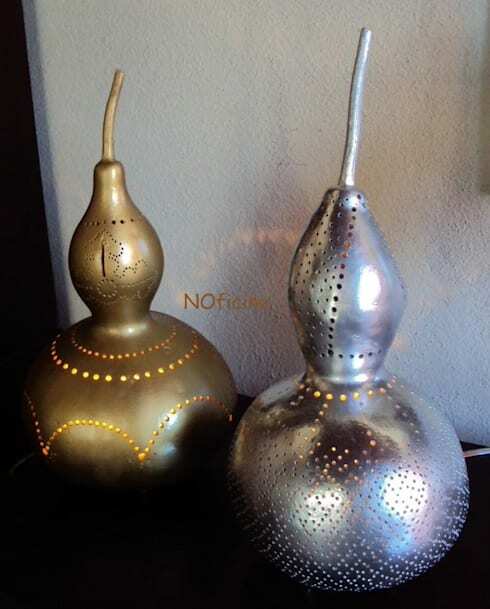 These lamps with a festive air were created by the workshop Noficina. They seem to be made of metal, right? But it is not! They are made of gourds, dry and clean inside, which were later drilled in patterns and painted in metallic colours. A small lamp is then placed in an opening in the base, and when turned on, the light escapes through the perforations. This projects the patterned light onto the walls in beautiful motifs! The idea, though excellent, will not easy to implement, particularly when it comes to finding the right materials if you don't live in the countryside. But they are gorgeous, are they not? An easy solution will be to rather just buy them in store. 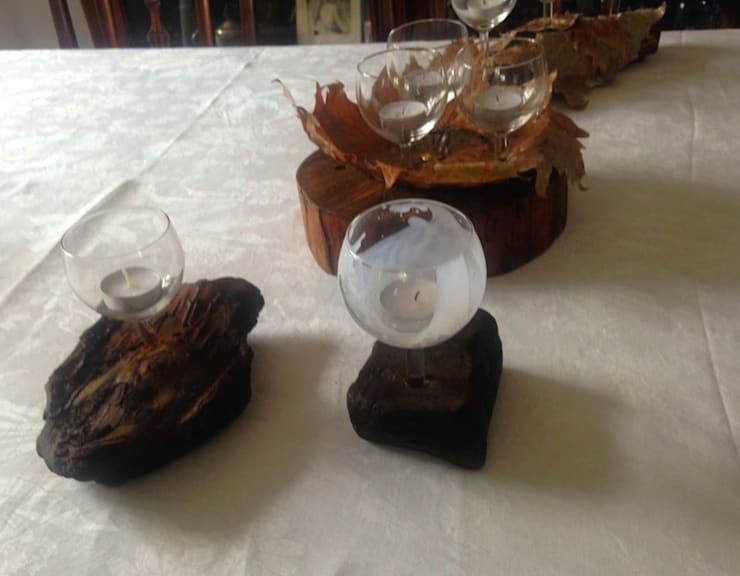 Rather simple materials are used to make these candlesticks, which are perfect for centre pieces and can be used as beautiful Christmas decorations! Get outside, take a walk, and find the materials you need. Try and find beautiful leaves which you can dry out. Arrange pieces of pine bark. A piece of wood, once cleaned and treated, is very beautiful. Just add these various elements around a small glass bowl, put a candle in the middle, and there you have your candlestick! Simple, right? All that counts is your imagination! More for festive inspiration, you might like to check out: Christmas Decorations For The Small Home. Have you decided to make your own decorations this Christmas? Share your ideas with us in the comments!